What controls Alexandrium cyst germination in Puget Sound? 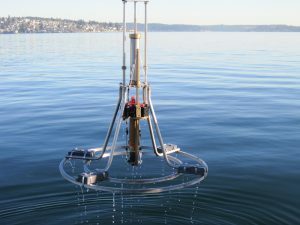 Experiments were carried out in the laboratory using cysts collected from benthic seedbeds to determine if excystment is controlled by internal or environmental factors. The results suggest that the timing of germination is not tightly controlled by an endogenous clock, though there is a suggestion of a cyclical pattern. 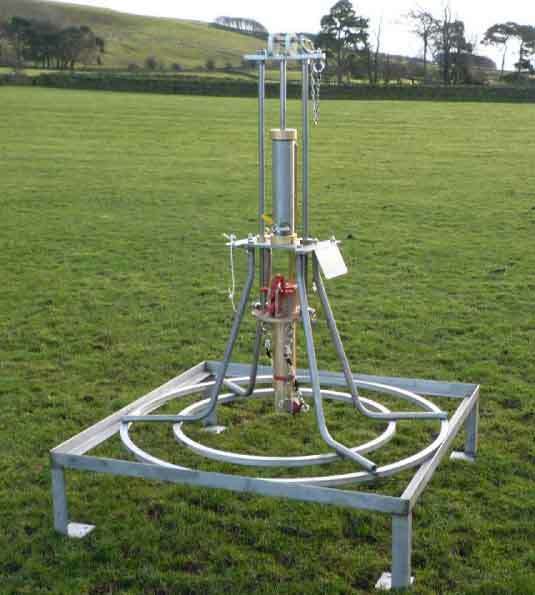 This was explored using cysts that had been stored under cold (4ºC), anoxic conditions in the dark and then incubated for 6 weeks at constant favorable environmental conditions. Excystment occurred during all months of the year, with variable excystment success ranging from 31-90%. 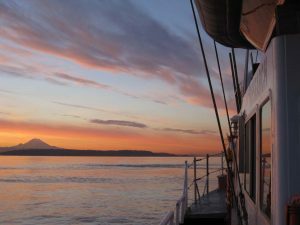 Caption: Excystment of Alexandrium from Quartermaster Harbor. 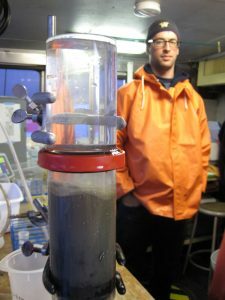 Cysts (n = 30) were isolated from sediments stored in cold, dark, anoxic conditions at 2-week intervals from June 2012 until May 2013 and germinated in 96-well plates at 14°C. The x-axis location of markers for excystment represents the day that the sediment was retrieved from cold storage for cyst isolation, and the value for excystment is the cumulative result from the three checks over the 6 weeks that plates were observed. From Moore et al. in press. 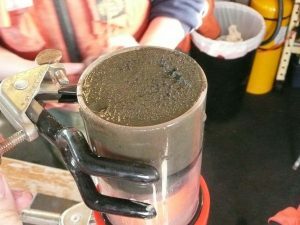 When cysts were isolated directly from freshly collected sediments every month and incubated at the in situ bottom water temperature, a seasonal pattern in excystment was observed that was independent of temperature. This pattern may be consistent with secondary dormancy, an externally modulated pattern that prevents excystment during periods that are not favorable for sustained vegetative growth. 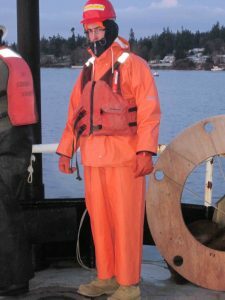 However, observation over more annual cycles is required and the duration of the mandatory dormancy period of these cysts must be determined before the seasonality of germination can be fully characterized in Alexandrium from Puget Sound. 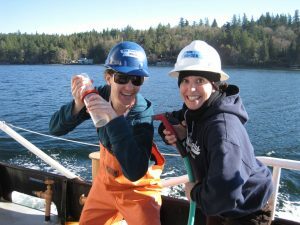 Caption: Monthly variation in (A) water temperature at the seafloor of Quartermaster Harbor, (B) Alexandrium excystment using freshly collected sediment from Quartermaster Harbor, and (C) the abundance of Alexandrium spp. 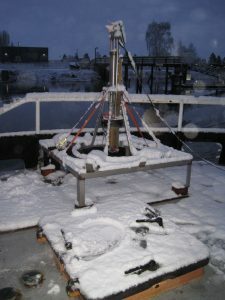 vegetative cells in the surface water at dockside location in Quartermaster Harbor over the period March 2012 to February 2013. Vegetative cell abundance data are provided by the SoundToxins program. 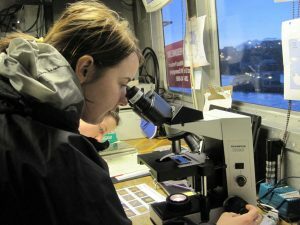 Isolated cysts (n = 50) were germinated in 96-well plates at in situ water temperatures measured at the seafloor at the time of sediment collection. The x-axis location of markers for excystment represents the day that the sediment was collected, and the value for excystment is the cumulative result from the three checks over the 28 days that plates were observed. From Moore et al. in press. Both temperature and light were found to be important environmental factors regulating excystment, with the highest rates of excystment observed for the warmest temperature treatment (20°C) and in the light. Caption: Time course of Alexandrium catenella excystment at 10, 12, 15, and 20°C in the (a) light and (b) dark. 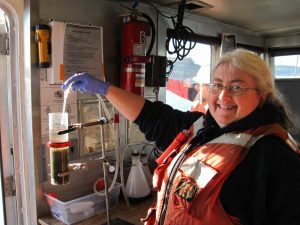 Cysts were germinated in flasks using sediment collected from Bellingham Bay in February 2012. Percent excystment was determined by subtracting the number of cysts that remained in the flask (i.e., did not excyst) after 1, 3, 5, 7, 9, 14, 21, 42, and 63 days from the concentration of cysts at time zero. Markers represent the mean value of duplicate flasks for each time point. From Moore et al. in press. 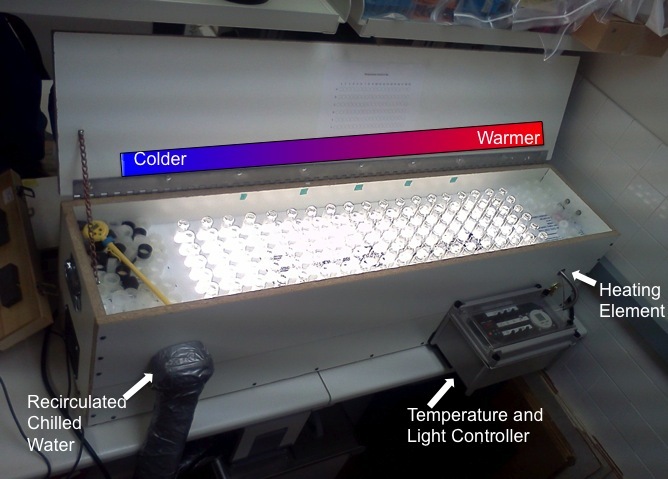 The growth and toxicity of Alexandrium catenella were examined using an apparatus called a temperature gradient bar (TGB). 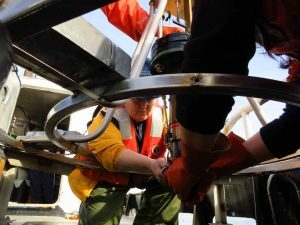 The TGB maintains a constant gradient of temperatures and allowed us to examine growth and toxicity in relation to changing temperature and salinity conditions. 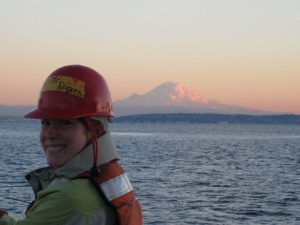 Two strains of A. catenella were isolated from Puget Sound and after acclimation to the experimental conditions for 2 weeks, growth was recorded at 19 temperatures ranging from 5-28°C and 6 salinities ranging from 10-35 psu. The maximum average specific growth rate (µ) was 0.52 day-1 with optimal growth (> 0.25 day-1) observed for temperatures between ~10-21°C and salinities between 15-35. 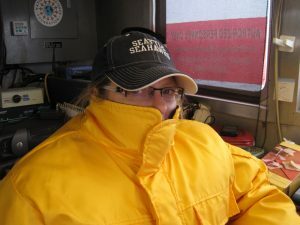 No significant growth was observed at temperatures below 7.7°C, above ~21-24°C (depending on salinity), or at 10 salinity. Average cellular toxicity (toxin content), determined during the early stationary phase of growth, ranged from 0.3–77.3 pg saxitoxin equivalents cell-1, with the highest toxicity occurring with environmental conditions that promoted slower growth. 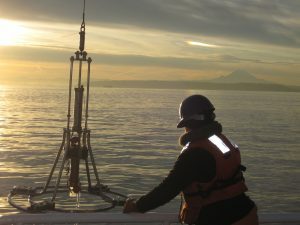 Experimental results were used to create a growth response surface for A. catenella in Puget Sound as a function of temperature and salinity. 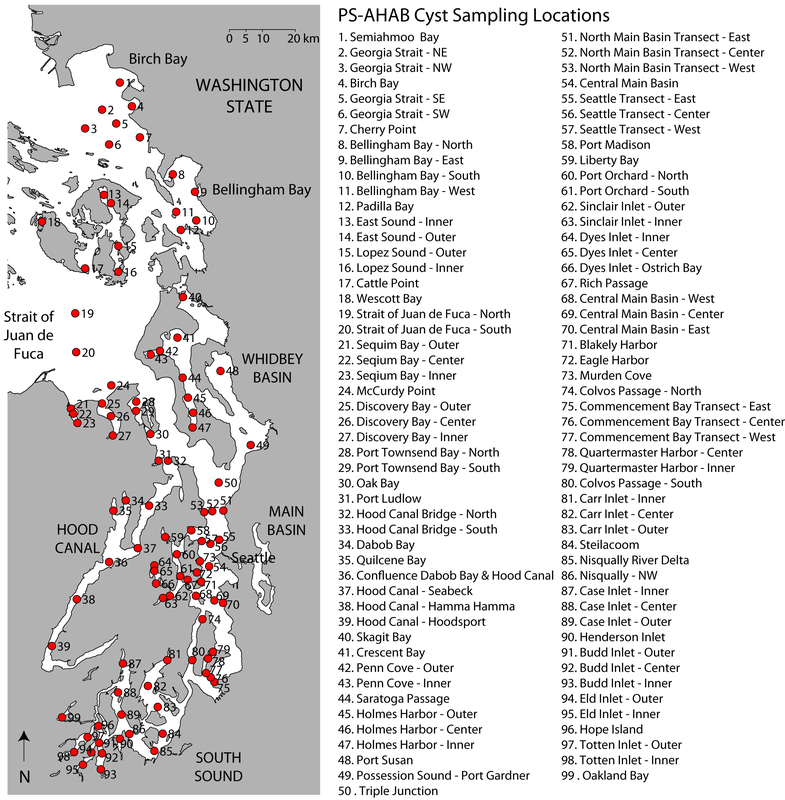 Modeling efforts combine this growth response with data on cyst distributions and germination rates to map favorable habitat for A. catenella in Puget Sound, both for the present-day and in a future Puget Sound influenced by climate change. 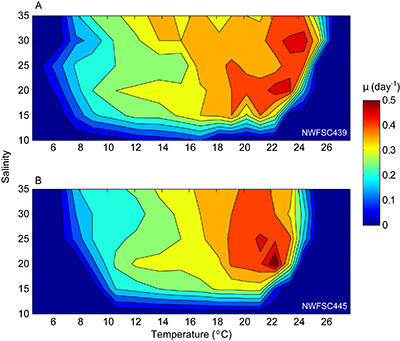 Caption: Contoured values of Alexandrium growth (µ, day-1) in response to temperature (°C) and salinity for (A) NWFSC 439 and (B) NWFSC 445. µ = specific growth rate. From Bill et al. submitted. 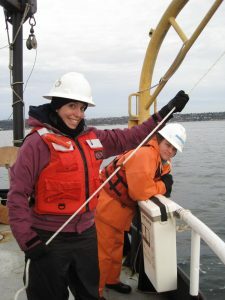 The 2013 winter cyst survey was conducted on the R/V Barnes in 2 legs from January 11-21 and January 27-February 2. 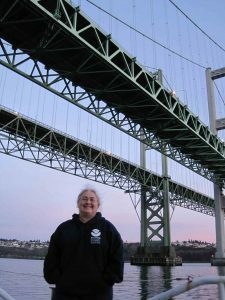 Many thanks to the cruise participants! 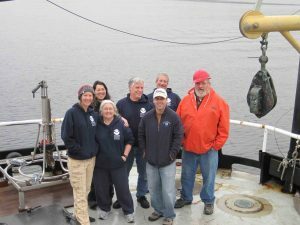 This was the final cruise of three that were scheduled for the PS-AHAB program, funded by NOAA’s Ecology and Oceanography of Harmful Algal Blooms (ECOHAB) Program. We look forward to analyzing our results, hearing from our stakeholders, and pushing forward with our research. 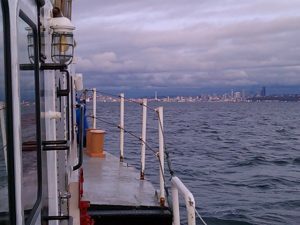 The 2012 winter Alexandrium cyst survey was conducted on the R/V Barnes in 2 legs from January 13-22 and January 29-February 4. 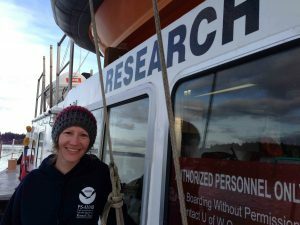 Many thanks to the cruise participants, who even braved the January snow storm in the name of science! 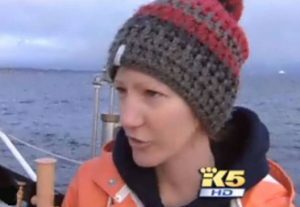 We were glad to have Glenn Farley from King 5 and Ashley Ahearn from KUOW join the crew for a day – to see their stories, click on the “Publications and outreach” tab on the left of your screen. 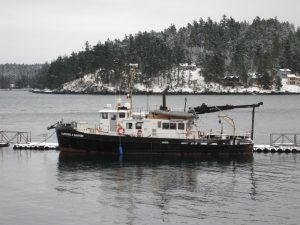 The 2011 winter Alexandrium cyst survey was conducted on the R/V Barnes in 2 legs from January 13-21 and January 31 – February 8. 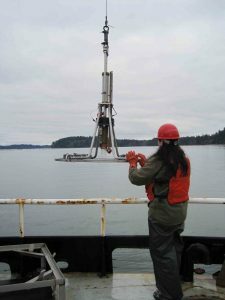 The survey area is in Puget Sound and the Strait of Juan de Fuca from Birch Bay in the north to Olympia in the south. The timing of these cruise legs was carefully scheduled to occur after the newly formed cysts had settled in the sediment but before potential germination of mature cysts in the spring/summer. 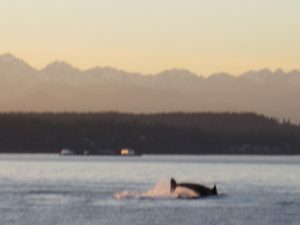 Many thanks to the cruise participants! 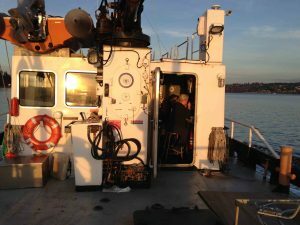 Sediment was collected from Quartermaster Harbor on board the R/V Barnes so that researchers could harvest cysts of Alexandrium and conduct experiments to determine the endogenous (i.e., a biological clock) and exogenous (i.e., environmental) factors that regulate germination. Caption: Cysts of Alexandrium viewed under the microscope. 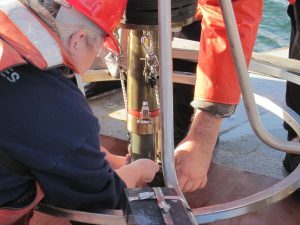 The Craib Corer below was specially designed and fabricated for the PS-AHAB Alexandrium catenella cyst surveys. Map of cyst sampling locations, as discussed at the 2010 stakeholder workshop. Click for a larger image.